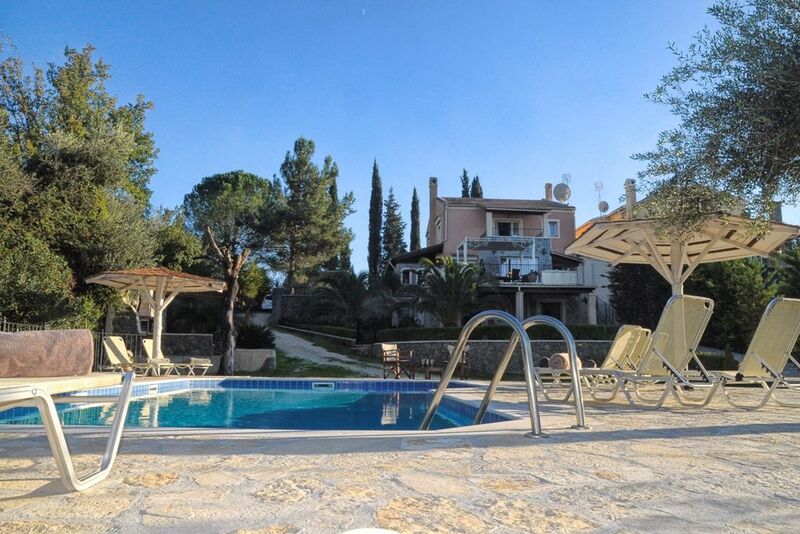 Family Friedly Cpacious 6 bedroom villa with beautiful pool and large garden. Get away from it all when you choose the charming Villa St. Nicholas House & Apart. in the resort town of Dassia in Corfu island. It’s an idyllic and picturesque setting for a family holiday or for a group getaway where up to 14 people will be sharing this stylish villa. St. Nicholas house & Guest apart. is a superb detached villa conveniently located in an idyllic pastoral setting, less than 300m from the shops, restaurants and the lovely sandy beaches in the popular and picture postcard resort of Dassia. The morning swim is only 250m away. This modern designed villa is constructed over three floors with the ground floor living area particularly spacious and bright, and with large patio doors leading out to the front terrace, allows attentive parents to supervise the younger family members splashing about in the swimming pool from the comfort of the lovely outdoor sofa’s, a perfect vantage point for the hotter parts of the day! From the upstairs bedrooms, there is a partial sea view from the lovely balcony and provides a perfect setting for a well-earned, end of the day sundowner! With six bedrooms, including 2 bedrooms with external access on the lower ground floor, this is a perfect villa for groups of friends, or large family get-togethers. This truly is a serene setting, with attractive gardens, a fabulous private swimming pool and less than a 10 min walk from the beach and resort facilities, what more could you possibly ask for from a holiday villa. Previous guests, mostly extended families or friends, have remarked how this setup allows them to enjoy privacy when they choose to take some moments away from the group. It is ideal for multi-generational families or groups of friends, who want to be together and at the same time enjoy privacy when they wish. You can enter the premises of St. Nicholas House & Guest Apart. in Dassia from Corfu international airport, with a car journey of just 15 minutes. The whole area that wraps the villa is copiously rich with marvellous natural settings. Some days of stay in our villa will certainly give you, memorable holiday moments. You will have to move only a little distance from the villa site, to enter the wonderful beach area! Similarly, as the village centre is very close you will have easy access to nearby facilities. On the ground floor is the Guest apart with two bedrooms, living - dining room, kitchen and bathroom. On the first floor you've got the main comfortable living room-dining area with three double sofas and two arm-chairs, coffee tables, TV with satellite and DVD/CD player, the fully equipped kitchen, along with a double bedroom with en-suite bathroom and an extra WC with walk-in shower . Up on the second floor, meanwhile, there's a large bathroom with a glamorous corner bath and twin basins, not to mention the master bedroom with en-suite bathroom and elevated double bed. There's also a triple bedroom on this floor, styled very much with children in mind, which connects to another triple bedroom with tv, dvd. Outside you'll find a barbecue and a peaceful patio area with table and chairs that's perfect for al fresco dining. There are also sun loungers for relaxing and enjoying the garden and the swimming pool. Large balcony area with table and chairs for the outside eating together with soft furnished seating for relaxing and enjoying the view. So whether you wish to simply relax and enjoy the view, perhaps with a chilled glass of something delicious, or enjoy the opportunity for al fresco dining, this area is ideal at any time of day or evening. Large private pool 10x5 meters with sun beds and umbrellas invite you to relax and enjoy hot summer days. Dassia is situated along a pretty stretch of coastline. It is lined by the beach and coastline on one side and an abundance of olive groves and countryside on the other side. Has a long stretch of pebble and shingle beach that can be reached by various side roads leading off from the main road that runs through the resort. Dassia beach gently slopes to clear shallow waters and is ideal for swimming. The waters are also very calm and flat making it safe for children and great for watersports. We are Dinos & Sandra and will be glad to provide you with information & assistance during your stay in our house. We will welcome you at your arrival to give you the keys and show you all the house facilities. You can always contact us by phone or email during your stay if you need anything else. A possibility for a pick up from the airport or the port is also available (message us for more details). We hope and wish that your stay in Corfu will be memorable and an unforgettable experience! Large bathroom with a corner bath, wc and twin basins sharing bedrooms 2 and 3. En-suite bathroom to bedroom 1 with shower, wc. En-suite bathroom to bedroom 4 with shower, wc. Bathroom with bath/shower, wc sharing bedrooms 5 and 6. Bathroom with walk-in shower, wc. Linen provided and changed twice weekly. Towels provided and changed twice weekly. Please note that pool towels are also provided. Two comfortable living rooms with 5 double sofas and two arm-chairs, coffee tables, flat screened TV with satellite and DVD / CD player. Doors open to the terrace with pool and sea views. Two fully equipped kitchens with freezer, fridge, grill, hob, iron and board, microwave, oven, toaster, ceramic four ring hob, dish washer, electric kettle, crockery, cutlery and kitchen utensils. Outside: Shaded dining area next to living room seating 10 - 14 persons. Great for extended families in need of space, this villa is spread over three levels and is like two homes rolled into one. Large patio doors leading out to the front terrace, allows attentive parents to supervise the younger family members splashing about in the swimming pool from the comfort of the lovely outdoor sofa’s, a perfect vantage point for the hotter parts of the day! The upper dining terrace is just magnificent and can accommodate up to 12-14 people for dinner. Two twin bedrooms are connected, can be made up as triples for the children to be together. Free Wi-Fi all around and A/C bedrooms. Cleaning/towels/linen/maid service: Maid service provided three times per week. Linen and towels provided and changed twice weekly. Please note that pool towels are also provided. We are available to deal with any requests that may have during your stay and you can contact us by telephone throughout your stay, in case of any problems or emergencies. We had an amazing stay at this villa. The villa was clean, well maintained and had everything that we needed. The pool was enjoyed by everyone and the short walk to the quiet beach was rewarded by fantantic snorkelling - go in the morning when there are so many fish and the sea is calm. Online shopping meant that we didn't need to hire a car, and there are some lovely places nearby (Delvino's is a great place for a drink, despite the busy road) But the best thing about this holiday was meeting Dinos, the owner. The service he provided was top notch and he is such a lovely man. He was helpful in so many ways and helped make the holiday of everyone in our party. Thank you Dinos and we would nt hesitate to recommend St Nicholas House to anyone. Thank you so much for your kind words. It was great pleasure for me meeting you. I am very pleased you enjoyed your holiday in Corfu. Hopefully we'll welcome you again in the future! I can't think of one thing that could be improved about the villa. It's clean, well appointed and spacious with plenty of outdoor and indoor seating in shade and sun, with a lovely pool. 7 children had a ball! Dinos, the owner went out of his way to be helpful and is always on call - the perfect host. Sea is walking distance and the bay is beautiful - at night the fields that sit near the beach are alight with fire flies - an extraordinary and beautiful sight. Local bars and restaurants are welcoming and friendly and food is delicious and reasonably priced. Will definitely return. Thank you for taking the time to write such a beautiful review. It is a pleasure to hear that all members of your lovely family fully enjoyed their stay at the villa. I am looking forward to welcoming you back soon. owners very helpfull: suggestions for trips, help with ordering some food first evening, pick up and drop off at the airport, perfect suggestions for bakery, bike rental, etc .. Thank you very much for your kind words. We are feeling so happy about your great impressions for Corfu island and our villa in Dassia. Hoping to see you again soon, we wish you all the best! Villa très agréable, confortable, spacieuse avec une belle piscine. Le propriétaire est très accueillant. Il nous a donné de bonnes adresses pour manger dans des tavernes très typiques où l'on s'est régalé pour un budget raisonnable. The home owner was very friendly and helpful. Helped by the tourist information and car rental. The house was also excellent and I recommend to stay there. You will have nice holidays! Beautiful villa with every convenience you could require. Dinos was on hand to collect us from the Airport and was only too happy to help with any queries. He recommended some lovely restaurants and was able to help with car hire or taxis. The pool was divine. The villa itself was amazing and I would recommend it to anyone. Thank you Dinos and Sandra. Thank you very much for your kind words! We are so happy and satisfied when our guests leave our villa with beautiful memories. We are hoping to welcome you again in the future. Dassia is one of the most beautiful and well known resorts in Corfu, where visitors return year after year. Dassia has an abundance of quality restaurants offering a good selection ranging from traditional Greek cuisine and unique Corfiot dishes to Italian and Indian. For those on a budget you can get a good three course meal for under £ 10 and sample quality Greek cuisine for just a few pounds. There are plenty of tavernas to choose from which is one of the main reasons we would not recommend any of the all-inclusive on offer in the resort. There is a good range of both basic tavernas and quality restaurants to keep everyone happy. The Greeks adore children and they are more than welcome in most bars and restaurants. Tennis in Dafnila, bird watching, cycling, fishing, gymnasium, health spa, horse riding, night life, sailing, scuba diving, walking, water sports. Aqualand: Corfu's water park, is great fun for all ages. Situated in the Ropa Valley, just 20 min drive from Dassia, the park has a great selection of slides and rides, a lazy river and pool. Evening entertainment in Dassia is relaxed, laid back and varied. There are enough bars to keep everyone happy, but Dassia is not a lively nightclub resort as such. There are no clubs, but there are two very lively disco bars that are open well into the early hours. There are also lively bars on the beach. Other activities available are organized excursions to Corfu town, tours of the island and to nearby Albania , walking trips in the surrounding countryside, diving excursions. You can rent a car or scooter to explore the island at your own pace, but there is also a frequent bus service to Corfu town and to the beautiful village of Kassiopi which stops at a multitude of small secluded bays such as the beautiful fishing villages of Nissaki, Kerasia, Kouloura and Agni, where you can enjoy a swim and a bite. The golf course is approx 30 min drive and located in Ermones. The golf course is the most beautiful in whole Greece and it attracts a big number of golf players from all around the world, it has a great landscape and it is also suited for walking. Local supermarket and bakery 300 m, 24 h bank-cash 300 m.
• Booking Notes: Payments By Credit Card (Visa/Mastercard) or Bank Transfer. 25% deposit of the rental amount required to secure booking. The booking can not be confirmed until this deposit has been received. The balance of the amount can be paid upon arrival in cash. Rental Rates include all local taxes, utility bills and final cleaning. No additional fees to pay when you leave. Rental durations less than 7 days considered if it fills a gap. Maid Service, Laundry and Towels included within rental rates. • Changeover day : We will be flexible wherever possible, but prefer changeover day to be Saturday. Departure by 10.30 am and arrival not before 3 pm, this is to accommodate cleaning and properly preparing the house for your stay. A possibility for a pick up from the airport is also available (message us for more details).